Left to right: British Ambassador, Robin Barnett; Shed Manager, Mariusz Kokornaczyk; and Mayor of Wolsztyn, Wojtek Lis. Photo BTWT. The mood is sombre in Wolsztyn these days: the regular pair of scheduled steam passenger workings has been suspended for a whole year; only one locomotive, Ol49-69, is in ticket; Leszno depot is due to close and its engineering facilities will be lost; idle drivers sit around grumbling, and contemplate early retirement. The negotiations between the main decision-makers seem to have ground to a halt. While a breath of optimism was injected into the negotiations when it was announced that the plan to form a commercial company to run the depot was being superseded by a project to set up a cultural institute (BTWT 8 May 2014) instead, the reality is that the various local authorities just do not have the financial resources to pay the annual subsidies that the PKP Cargo business plan envisages. An ugly game of one-upmanship seems to be being played out. The original suspension of steam services last March took place when the Chief Executive of Wielkopolska provincial government felt that PKP Cargo were dragging out the negotiations, since then a majority of PKP Cargo shares has been sold and Cargo is effectively a private company. 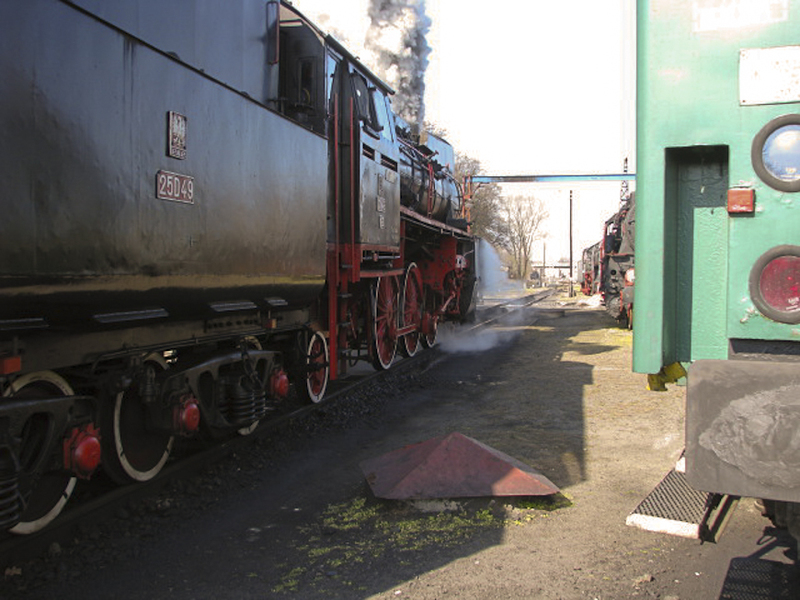 Responsibility for maintaining Poland’s steam heritage sits uncomfortably alongside the company’s commercial aspirations. Now it is PKP Cargo that is keen to speed up negotiations – a fortnight ago the Mayor’s office was informed that unless the local authorities signed up to the business plan there would be no Parada Parowozow (Wolsztyn’s annual parade of steam locomotives) this year. At a few minutes past 10:00 on Tuesday 17 March, Robin Barnett, CMG, Her Majesty’s Ambassador to Poland, swept into this forbidding environment like a breath of fresh air. His enthusiasm was infectious and provided a much-needed morale boost to all those who accompanied him around the shed. The British Ambassador came to Wolsztyn at the invitation of Wojtek Lis, the Mayor of Wolsztyn, and a passionate enthusiast of steam locomotives since his student days. 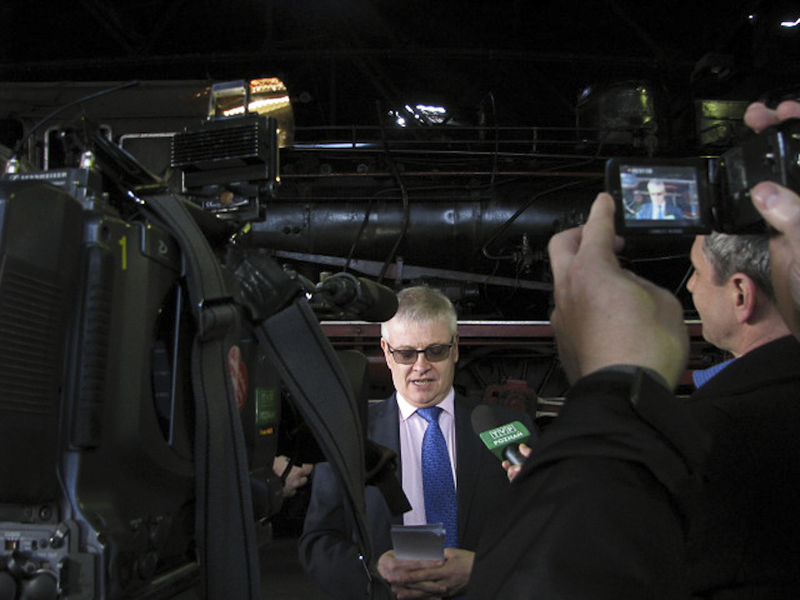 Robin Barnett says a few words for the benefit of the press. Though the Ambassador spoke in Polish, thanks to the help of the British Embassy, we managed to obtain a copy of his speech in English. a visa. So I would like to say a special thank you to the Mayor of Wolsztyn, Mr Wojtek Lis for inviting me to Wolsztyn and letting me revisit the sights and smells of my first time in Poland. I would also like to thank Mr Mariusz Kokornaczyk, the shed master for putting one of his historic locomotives in steam and answering all my questions. I need to learn more specialised vocabulary po polsku! 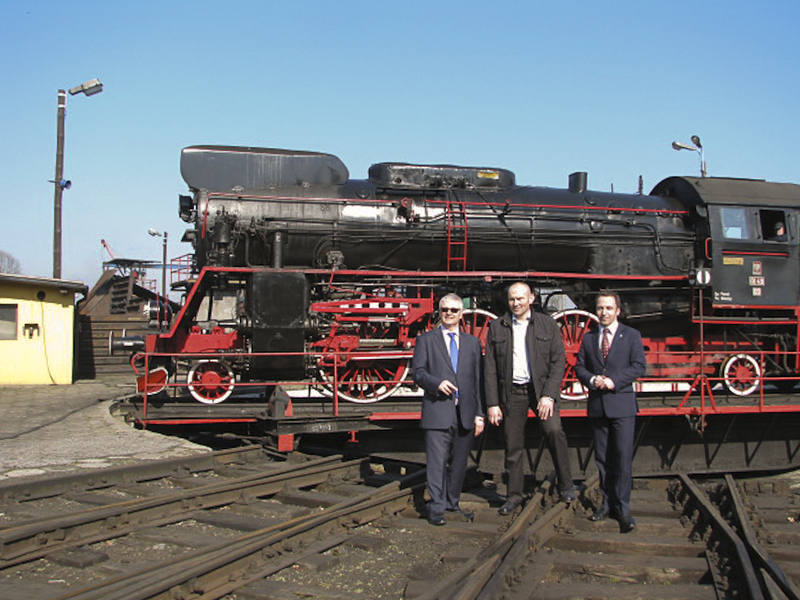 I would also like to congratulate the PKP group and more specifically, PKP Cargo, the custodians of Wolsztyn locomotive depot, for recognising the unique heritage value of the depot and its locomotives and for preserving the complex as a going concern for the benefit of future generations. I have been told that talks are in progress between PKP Cargo, the Marszałek’s office, the Starosta and your Burmistrz regarding setting up a new entity to secure the long-term future of the shed. I very much hope that these negotiations will soon reach a successful conclusion. The Wolsztyn depot, its engines and its trains, are not only a wonderful Polish asset with huge potential to attract tourists – they are also important in the European context. Finally, while today is all about railway heritage, I would like to say a few words about the future of railways. The future is all about integrated transport systems. Roads will always play a vital role but they are increasingly full in many places and have environmental implications. So rail is an essential ingredient of any successful transport strategy. Freight trains, commuter trains, light rail and PKPs impressive new Pendolino will all be crucial for Poland’s future economic growth. Today Britain’s railways transport more passengers than at any time since the Second World War. We are well on the way to completing Crossrail – Europe’s biggest urban infrastructure project, a 15 billion pound project to improve commuter services by constructing a new railway under London. We are also about to embark on HS2, a 43 billion pound project to build a new high-speed railway from the London to the north. Helped by almost 8 billion of EU funding between now and 2020, I am certain that Poland’s railways will also experience a great renaissance, which will give me great pleasure. I have to admit though that, much though I have enjoyed using Pendolino, for me, my heart will always be with steam. Robin Barnett about to have his driving lesson. Photo BTWT. 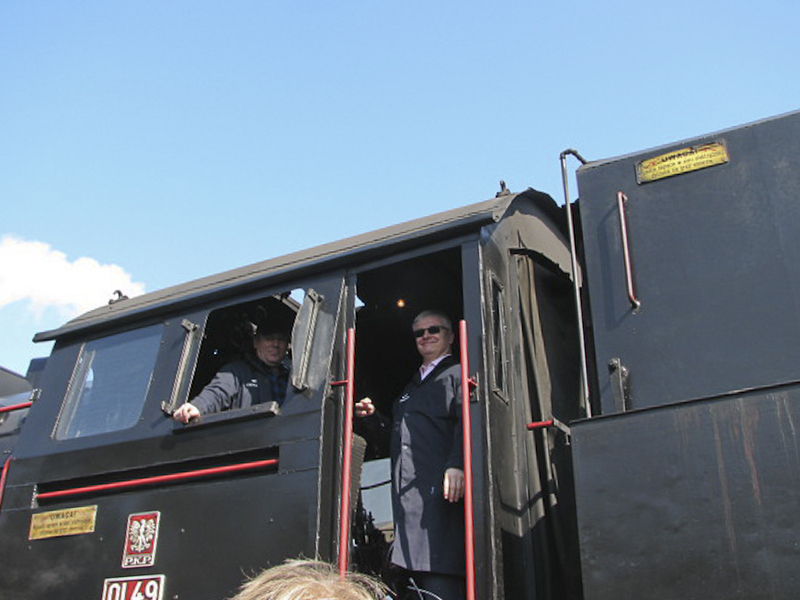 The highlight of the Ambassador’s visit to the locomotive depot was when, armed with a PKP Cargo footplate pass, he mounted the footplate of Ol49-69 and, after having had the controls explained to him by Howard Jones of the Wolsztyn Experience, he then – under the eagle eye of one of the Ol49’s regular drivers – gradually opened the regulator and took the loco for a spin down the loco yard. With Robin Barnett at the controls Ol49-69 accelerates down the depot yard. Photo BTWT. Polish TV’s TeleExpress crew were there to record every detail of the trip and a splendid piece went out that day on Poland’s main TV channel giving the shed – and everybody’s hopes for the return of daily steam workings – a terrific plug. 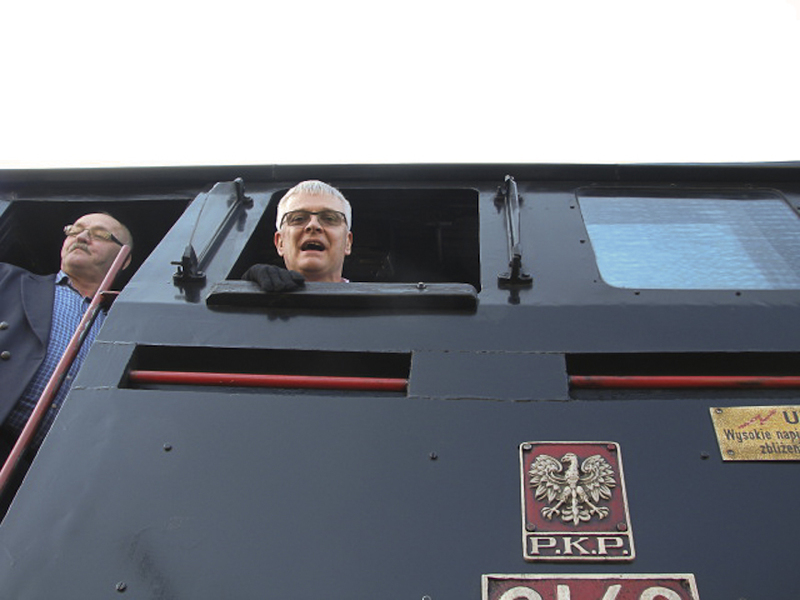 Even PKP Cargo got into the mood and their Press spokesman, Mirosław Kuk, announced that the twenty-second annual Steam Locomotive Parade in Wolsztyn WILL take place this year on May 2!